International Boxing Federation Super Middleweight champion Jose “Bolivita” Uzcategui of Venezuela, but a resident of Tijuana, Mexico is ready to show the world that he is the best 168 pounder in the world when he takes on undefeated Caleb “Sweethands” Plant this Sunday, January 13 at the Microsoft Theater in downtown Los Angeles. Uzcategui (28-2, 23 KO’s) will be making the first defense of his world championship against Plant (17-0, 10 KO’s) in the main event of a card promoted by Premier Boxing Champions and televised live on FS1 and Fox Deportes. “I am looking forward to getting in the ring and showing all my talent and put on notice all the champions in this division. I want to be the best and I am willing to face the best,” said Uzcategui, who trained in Tijuana and San Diego for this fight versus Plant. The Venezuelan strongman, has lived in Tijuana for over 10 years and will once again is eager to represent both countries in the best way possible. 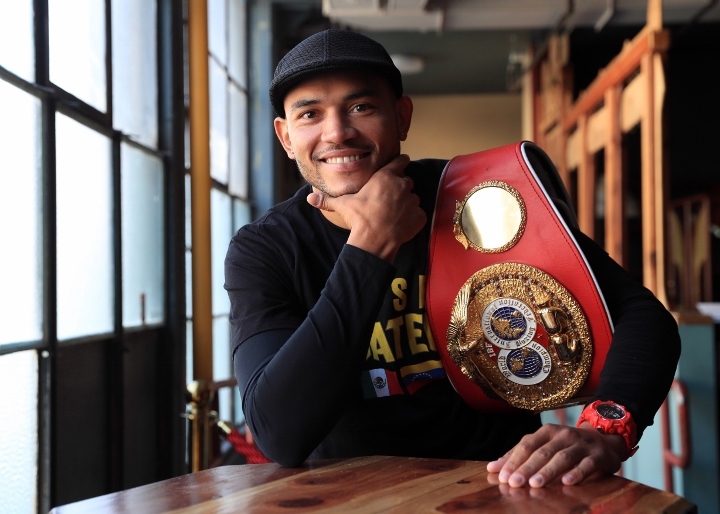 “I represent both my countries with pride and honor and I know that when I get in the ring a lot of people support me and I want to bring them both a victory and a great fight on Saturday night,” said Uzcategui, who is promoted by Fernando Beltran, Zanfer promotions. Uzcategui laid a beating on Andre Dirrell, forcing the fight to be stopped two seconds into the ninth round to claim the International Boxing Federation (IBF) interim 168 pound belt in a one-sided fight on March third of last year at the Barclays Center in Brooklyn, after being unjustly disqualified in this first contest with Dirrell. In his most recent fight on September of last year in Oakland, California in a non-title fight Uzcategui took home a unanimous decision win over Ezequiel Oswaldo Maderna of Argentina. “It should a great fight with Plant, I will take the fight to him and I hope that will be willing to engage and give the fans a spectacular fight,” said Uzcategui. “I expect a great showing from Uzcategui, he is a warrior who will leave everything in the ring and will walk away with the victory,” said his advisor Sean Gibbons.